Anyone who has completed secondary level education is eligible to apply for any language program offered by the Campus. However, a bachelor’s degree is a must to join ‘Advanced /Writing English’ program. For Foreign Students – July until the end of May (for the Summer Semester) and February until the end of December (for the Winter semester). For Nepalese Students – January (for the Winter semester) and the end of June until mid-July (for the Summer semester). Semesters run from the 16th July to the middle of December and from the 1st February until the middle of June. Application for admission must be submitted on an official application form, available on request at the Campus admission office, on the payment of 500 Nepali rupees. The form may also be downloaded from the Campus website, the payment for which must be made at the time of arrival in Nepal. Another option available is that the student can pay the application fee along with the tuition fee. The application fee is US $ 5. 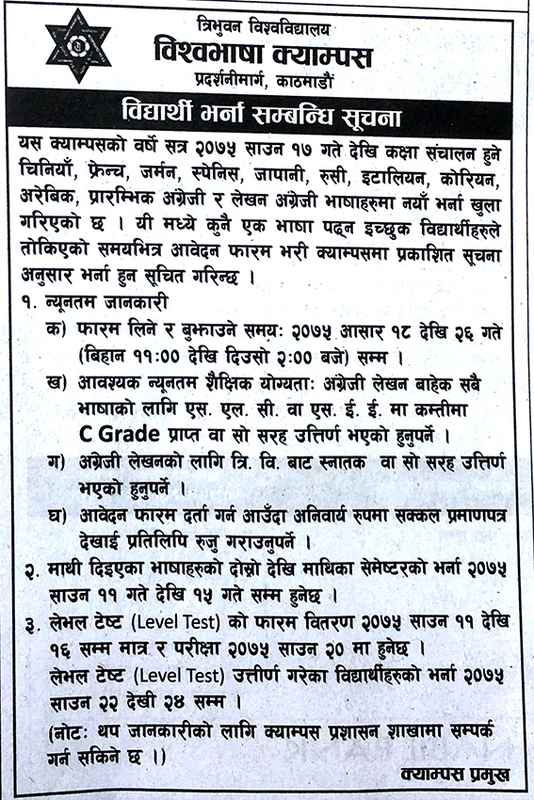 Applicant should possess at least ten years of school education equivalent to Nepal’s School Leaving certificate (S.L.C)./SEE of equivalent to that. The student should submit two passport-sized, two auto-sized photographs, two photocopies of the passport that clearly show the passport holder’s name, place and date of birth, validity of the passport (over one year), and of the current visa (with over one month validity), and photocopies of the academic testimonials and transcripts confirming the qualification as mentioned in No. 1. along with an application form. The student needs to write a letter addressed to the Campus Chief stating how long the language course s/he would like to register for. The tuition fee is US $ 500 per Semester. Regular admission for semester begins in May (Summer Semester) and December (Winter Semester) Only. The students should pay US $ 100 if they came for admission in June and Januaray. However, the students who got admission in the following semesters should not pay $ 100.00 for ten days Publishing the results. For July session, the visa must be valid until July 15. For February session, visa must be valid until January 31st. From June 1st students must be paid US $ 100.00 late fee. From January 1st Late fee US $ 100.00. The amount should be deposited in the name of Bishwa Bhasha Campus AC No. 0110214194401 at Nabil Bank Ltd. Kantipath, Kathmandu. A recommendation or ‘no objection’ letter from the student’s concern embassy needs to be submitted along with two photocopies. A bank statement showing US $ 1500 deposited in a bank in Nepal needs to be submitted along with the application. If a student has dependent family members then additional amount of US $ 1000 per person is required along with two photocopies. The campus takes the responsibility of recommending the students for visa, but these then have to be approved by the Ministry of Education and granted by the Department of Immigration. The Home Ministry’s Department of Immigration is the final authority to decide whether someone should get a study visa or not. Students must bear the cost of the visa for themselves and any dependent family members personally. Service Charge for Every Dependent is US $ 60.00 for one semester. Classes are run from Monday through Friday per 2 hours a day any time between 10:30 AM to 2:30 PM. The students should be present for at least 70% of classes failing which the foreign students may lose their visa recommendation. Foreign students studying at the Campus are strictly prohibited from doing any job – paid or unpaid – in Nepal. The major holidays are for Dashain – Tihar (major national festivals of Nepal), all of January and July 1-15. Besides these, there are some 20 holidays for local and national festivals. The list of the holidays is supplied to the students at the beginning of each semester. Visa will not be extended unless student attends at least 70% of the classes. Visa will not be extended unless the students pay the full amount of tuition fee. Fee once deposited can’t be refunded in any case. A course can be launched only if there are at least 3 students enrolled for that language. If less than 3 have enrolled in a course those students will be transferred to another language of their choice. Following Students appeared in the Summer Semester Examinations of the following languages have been declared passed. Symbol No:	691, 692, 695, 696, 697, 700, 703, 704, 705, 706, 709, 710, 712, 713, 714, 715, 716, 717, 718, 719, 720, 722, 359. Symbol No:	736, 737, 738, 741, 742, 744, 745, 746, 749, 750, 752. Symbol No: 766, 767, 770, 771, 772, 774. Symbol No: 926, 927, 929, 930, 931. Symbol No: 526, 527, 529, 530, 532, 534, 535, 536, 541, 542, 543, 544, 549, 551, 553, 554, 555, 556, 557, 558, 559, 560, 563, 564, 565, 566, 568, 569, 570, 572, 573, 574, 575, 577, 578, 579, 580, 582, 583, 585, 586, 587, 588. Symbol No:	1266, 1267, 1268, 1269, 1270, 1271, 1272, 1273, 1274, 1276, 1278, 1279, 1281, 1283, 1284, 1285, 1286. Symbol No: 604, 605, 606, 607, 608, 609, 610, 611, 612, 613, 615, 616, 617. Symbol No: 627, 629, 630, 631. Symbol No:	641, 642, 643, 644, 645, 646, 647, 648. Symbol No: 661, 662, 663, 664, 665, 666. Symbol No: 676, 677, 678, 679, 680, 681, 682, 683, 684, 685, 686, 928. Symbol No:	1661, 1662, 1664, 1666, 1667, 1670, 1675, 1676, 1677, 1679, 1682, 1684, 1685, 1686, 1688, 1689, 1690, 1691, 1692. Symbol No: 1721, 1722, 1723, 1724, 1726, 1727, 1729, 1730, 1731, 1732,,1733, 1734. Symbol No: 1741, 1742, 1743, 1744, 1745. Symbol No: 1751, 1752, 1753, 1754, 1757.